DURHAM, N.C. – Duke football’s upward mobility from the 2-33 train wreck that David Cutcliffe inherited has allowed the school to join an exclusive club with Stanford and Northwestern as academically elite institutions consistently competing among Power 5 schools. Cutcliffe, entering his 12th year as the Blue Devils' head coach, needed four years of rebuilding, but by the fifth in 2012 Duke made its first bowl trip in 18 years. The sixth season was the major breakthrough with the 2013 ACC Coastal Division title and No. 20 national ranking. Wins and losses are one measuring stick, but another subtle but no less important gauge to the bottom line has been established on the recruiting trail. Duke (1-0), which plays Northwestern (1-0) at noon ET Saturday at Ryan Field in Evanston, Ill., no longer finishes an automatic third to Stanford and Northwestern when pursuing the athletes from the shallower pool of athletes possessing top academics (or fourth behind Vanderbilt of the SEC). Stanford on the West Coast might have been too far for his taste, but a decade earlier Dimukeje might have waited longer to hear from Northwestern in the Chicago area. However, he didn’t need to wait with Duke’s turnaround established by the time he was a 3-star recruit in the Class of 2017. The 6-foot-2, 265-pounder started all 13 games as a true freshman, earning Freshman All-American honors from ESPN. He finished with 40 tackles, two sacks, an interception and a fumble recovery. He opened 2018 with six tackles, a sack and a forced fumble in the season-opening 24-13 win last week over Army. Chris Taylor, a fifth-year senior wide receiver in the Class of 2013, was a 3-star from Miramar, Fla. He had an offer from Vanderbilt, but he didn’t wait to hear from Stanford or Northwestern. “When I got the Duke offer, it closed my recruiting,” he said. Taylor (6-1, 185), who was an Academic All-ACC selection last year that caught 25 balls for 332 yards and one touchdown, said an example seeking a high academic school destination was set for him by his high school training partner, Anthony Walker. He was an All-American linebacker at Northwestern that is now in his second NFL year with the Indianapolis Colts. 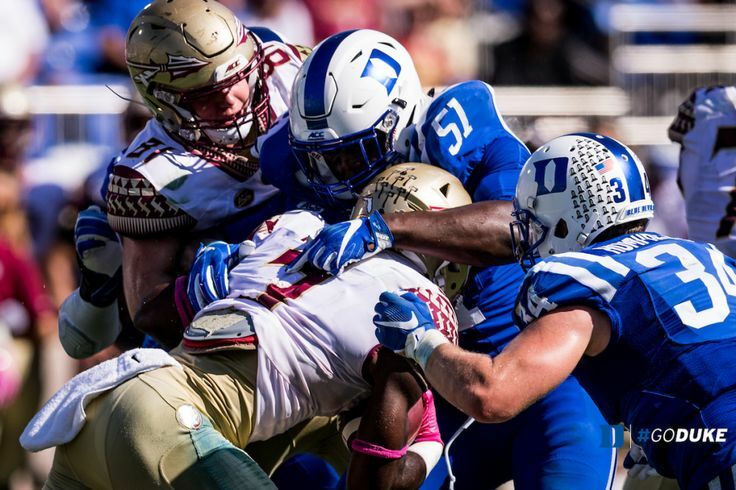 Duke fifth-year senior center Zach Harmon (6-3, 290), a third-year starter, wasn’t recruited by Stanford or Northwestern, but when the Blue Devils stumbled upon him he had the academics in place to accept a scholarship offer. Former Duke offensive line coach John Latina learned about Harmon while he visited Toledo Catholic Central’s campus to pursue quarterback DeShone Kizer (who later committed to Notre Dame). “That’s how I got introduced to coach Latina,” Harmon recalled. “Then I got a call that said Coach Cut wanted to meet me in person. I think I met coach Latina on a Monday, came down (to Durham) on a Thursday and committed to day after. I knew with a Duke degree it was a 40-year commitment once football was over. Harmon saw the ACC Coastal Division title season with a 10-4 record unfold while he played his senior year in 2013. Since 2013, the Blue Devils are 35-22 (.614). There have been bowl trips six of seven years since 2012. Cutcliffe’s early teams were unable to compete with Stanford, losing 44-14 in 2011 and 50-13 in 2012, but progress can be measured against Northwestern. Duke and Northwestern are meeting for the fourth straight season. Duke won 41-17 last year at Wallace Wade Stadium, although Northwestern won 19-10 in 2015 in Durham and 24-13 in 2016 in Evanston. Stanford, Northwestern and Duke all won their season openers last week to show up in this week's Top 25 voting. Stanford is No. 10 in the Associated Press poll and No. 9 in the USA Today/Coaches poll. Northwestern earned 28 points to equal No. 30 among others in the AP poll and 87 points to equal No. 27 in the USA Today/Coaches. Duke doesn’t have a vote in the AP poll, but gained nine points in USA Today/Coaches equals No. 35. That places the Blue Devils are in the same neighborhood if not ahead of Stanford and Northwestern. And that's another method of elite club membership.